One of the most common and easy to make salads is the pasta salad. 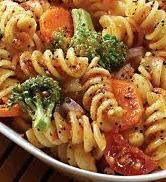 You will need a pound of wheat pasta, mustard sauce, beacon, eggs, onions, peas, mayonnaise, parsley, olive oil, salt, pepper and dash paprika. You can start off by hard boiling the eggs and cooking the pasta along with the beacon. After everything is cooled you should chop the beacon and eggs and add it to the pasta. You can then add the mayonnaise, and the mustard sauce. Dash a little olive oil, paprika and parsley leaves. It is best if you an serve this salad cold. You can add dollops of the sauce if the dish is too dry.